No, not the tale about how this pie came to be, the tale about the recipe I used! What’s the difference? So glad you asked, take a sit, it will take long. Well, everything began one morning of june, past century. It was the year 1999 and it was the last day of school. The last day of my first highschool year, I studied languages and that year, between ’98 and ’99, I started learning french. Taking very bad grades, 3 on 10. The first time I got a 5 we had a party at home. Anyway, somehow I managed to have a 6 (good enough) on my school record by the end of the year, but we -me and my classmates- also managed to get attached to our french teacher, and our french reader, and to put up a “end of school year party”. We would have cooked crepes, in our classroom. What about the tarte Tatin? Wait for it, you’re so impatient! Surprise (said in french), our french teacher comes in with an apple pie. Which looked pretty bad: a lump of brown-ish and shiny stuff. But, noblesse oblige, I take a bite. After that I would plunge into the cake head first. We had just created a new tradition: every year, for the last day of school, we would have had a party with class-made crepes. “Prooooof, can you bake us again the tarte Tatin?” “Girls! Come on! It’s a school, not a club!” “Pleeeeeeaaaase” “In french!” “S’il vous plaaaaaaait!!!”. I thin she liked a bit of praise (who doesn’t?!). 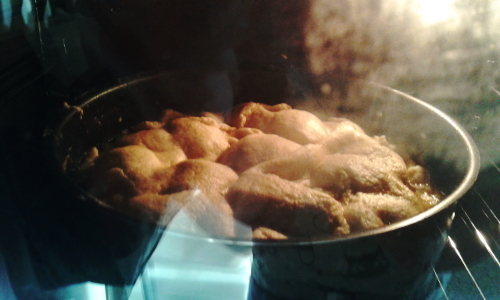 It’s the last day of the last year, I suddenly realize that I’ll never find such a pie anymore anywhere, I HAVE TO have the recipe… hoping my teacher is not one of those people very mysterious about their cooking. Well, that’s how I payed for the recipe for the tarte Tatin, with a 15 minutes french dictation on my very last day of school. Years go by, ten to be precise, I had translated the recipe as soon as I got home that day, and put it in my mom’s cooking books. It stayed there. I go to university, I go to France for my erasmus, I get a job, I move out of my parent’s house, I get married and yet I had not tried that recipe. Yet I have this fixed thought in my mind, I remember about that pie like it was yesterday. Some weeks ago I decide to give it a try, I start searching all my drawers. I can’t find the recipe. I resolve to look online for it, find a thousand (and also plenty of useful information, always read the comments to a recipe, they’re resourceful! ), I ask my mom if she has the recipe. She says she’ll look for it. The following day I get a text “Found it. I’ll bring it to you when I’ll see you”. But I do not have a pan for it. You need a baking pan that you CANNOT open, that is suitable both for your stove and your oven. Otherwise you can use a pan that has a tall rim and can be used in the oven as well (aka the handles must not be of wood nor plastic). I look everywhere to find one, I do not want to get one online because it means postponing the recipes further more. Then finally in the “new, huge chinese shop” I find my baking pan. And a little thingy used to diffuse the fire from the stove underneath terracotta casseroles… and maybe it’s good for my new baking tray as well. It’s time to give this recipe a try, so finally here it is. I had the idea of following it religiously and, in a second experiment, to try out some tips I picked up here and there. Knead the pastry quickly, form a dough and let it sit in the fridge for at least half an hour. Peel the apples, cut them in 4, remove the core. Turn on your oven to 220 or 200 degrees (celsius! 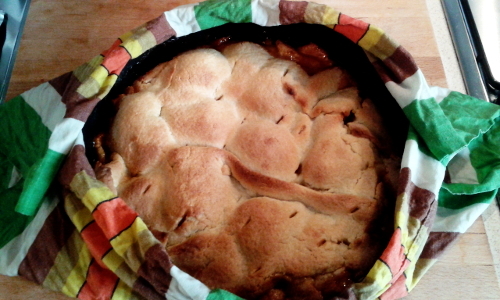 ), spread the dough and lay it on the apples, let it collapse in, prick the surface with a knife. Put in the hot oven for about half an hour. When the pastry is nicely golden, cover it with a piece of tinfoil, turn down the temperature of the oven to 180 degrees (celsius!) and let bake for 10 minutes more. Take it out of the oven, take a big clean rag, wet it completely, lay the baking tray on the wet rag, cover the borders with the wet rag (do not touch the pie crust with it) and let it sit for 10 minutes. Put the baking tray on high heat for one minute, flip it on a plate. Know this: it will take an entire afternoon to bake this. Here are a couple of advices I can give you, like “first hand experience” advice. Despite my intent I couldn’t follow the recipe entirely religiously withouth trying some tips (that I got mostly out of this french blog, Gordon Ramsay’s recipe and this italian blog). So, apparently the best apples to use here are the “golden” veriety, most of all if they are a little old therefore a little bit “sandy” (not so juicy anymore): when they are cooked they taste sweet but they do not give too much liquid. Ah! Luckily this was the type of apples that shouldn’t give too much juice! In fear of burning everything (and having read that you get good caramel on low heat), instead of “medium/high” heat I kept it medium. For the first 30 minutes. Then I turned it on “high” and cooked for 15 more minutes, because the apples were so juicy and there was no sign whatsoever of caramel. Plus I had read a lot of comments telling nasty episodes of hot caramel burning everyone and smearing everything (or people who had to pour it at some point), so I decided to let it evaporate as much as I could. Another thing I might try next time: letting the caramelized apple cool completely before I cover them with the pie crust, so maybe it doesn’t melt down immediatly. From the french blog and the british chef I decided to pick up the tip about caramelizing the borders of the pie crust as well, also trying to make it a “container” for the apples and the extra juice. Well… Gordon Ramsay makes it look incredibly fast and easy, to lift the fruit and tuck the pastry underneath it… I was afraid of burning my fingers and the dough was falling apart on my hands, so I did it the best I could (like when you’re making your bed in a haste, and you just push the sheets underneath the mattress with not much care). After that, another tip: know your oven. My oven is usually too hot (cakes that should be baked at 180°C I bake at 175/170), knowing this I heat my oven up to 200°C. I put the thing in the oven, set my timer to 30 minutes… after only 7 minutes I have to turn down the heat to 180. When there are still 15 minutes left to go I quickly cover everything with tinfoil and turn down the heat to 175 (the crust was already way too “golden”!) and I take everything out of the oven five minutes before the timer rings. To hell the additional 10 minutes at 180°C! It’s ok to follow a recipe good and through, but I really didn’t want to burn everything!!! Then I do what I was told: wet the rag, put the baking tray on it (it goes “shhhhhh”), let it sit for 10 minutes and, even though it felt useless to me, heat it on high heat for one minute. Now it’s the moment of truth: I had to flip the pie. I was afraid of burning myself with caramel and making it fly all across the kitchen: caramel, pie and ceramic plate (I lacked a larger backing tray to use as plate, so that the borders would keep in excess caramel), so I try to put my plate as centered as I can (my baking tray is 28 cm in diameter) and I wrap everything up in my wet rag again. It should prevent hot caramel from going to far out (and burning me) and also it should keep baking pan and plate quite firmly together. And, of course, I was wearing oven mitts. Inhale, courage! I tell myself, I refuse Sa’s offer of letting him flip the pie, and… flip! I lift the rag, I lift the baking tray: succes! Only two apples are still sticking to the pan along with a tiny piece of crust (and it was a non sticking pan!!! I guess that one minute over high heat is fundamental!!!) and there is no excess caramel, just a few drops here and there, few fundamental drops that make everything shiny and yummy! I start to mentally write this post. A parte che se sono così tanti e stanno conquistando il mondo, forse le loro pignatte radioattive regalano superpoteri e quindi non mi dispiacerebbe affatto.